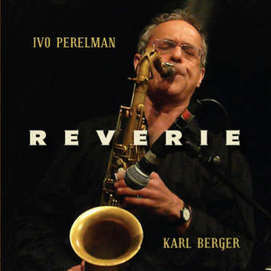 Ivo Perelman, tenor sax; Karl Berger, piano. The release of Reverie marks 25 years of recording for Ivo Perelman and more than 50 albums under his own name, since his first, Ivo, in 1989. He has released 17 of these since 2011, which is astonishing. Many other musicians might have succumbed to the temptation to release a retrospective album and the title of this one might have led our thoughts in that direction, but this Reverie is of a very different kind and in a way that dissimilarity is down to pianist Karl Berger. The saxophonist has in recent years been recording in his inimical, totally free style with pianist Matthew Shipp, who explores intense, impenetrable patterns and churning, spinning tempos. Berger is quite different and makes this album an unusual venture for Perelman, as it is markedly disparate to all that he has done before. Karl Berger, too, is an avidly experimental musician, but the divergence is in the spaces left in his playing and Perelman has responded to that. Both performers are reacting one to the other, both act in response to what they perceive aurally. The result is calmer, more lucid even, the same extreme fervour expressed more subtly, more elusively. Although Berger's own music often sounds like that of an old-hand, avant-garde musician of the classical calling (Heidelberg Conservatoire and University) he was in fact partnered with Ornette Coleman in establishing the Creative Music Studio in 1972 (Woodstock, N.Y.) and has played with Carla Bley, Marion Brown, Don Cherry, Lee Konitz, John McLaughlin, Roswell Rudd and Sam Rivers. Karl is 79. So, no back-tracking, Ivo Perelman is still moving forward and at speed. I am convinced that he will never repeat himself, never be lacking the incipient data that starts a new chain of thought that leads to the next step. His musical future lies in the future and whatever that may be, the anticipation in itself will be precious.